The Why This Book Should Win entry for today is from literary translator Peter McCambridge, fiction editor at QC Fiction (a new imprint of the best of contemporary Quebec fiction in translation) and founding editor of Québec Reads. Every afternoon, Marcel works with his uncle at the butcher’s. His hands in the red flesh, he strikes blows with the knife, cutting at just the right place, slashing what was formerly alive to give it a new shape, one of his own making. He doesn’t overthink it and moves instinctively. It’s hard not to see the parallels with the author’s own creative process as she imposes her will on this fictionalized account of her grandmother’s life. Suzanne was the maternal grandmother she barely knew. The first time she saw her, she was one hour old. The second time, she was ten. And the third and final time came when she was 26 and Suzanne wouldn’t say why she left. Barbeau-Lavalette hired a private detective to piece together her life, to tremendous literary effect. You had to die for me to take an interest in you. For you to turn from a ghost to a woman. I don’t love you yet. But wait for me. I’m coming. It begins in working-class Ottawa in the 1930s, the men “coming home from the factory with heavy hands and empty stomachs.” It’s cold and people are hungry in their hand-me-down shoes. We see the country’s first slums, there is no gas left for the cars, English mixes with French on the streets. Soon, Canada is at war, but people aren’t scared yet. Family stories share paragraphs with world history as the author invents conversations, everyday events, tics, and details to paint her portrait. The language is nothing short of gorgeous, the turns of phrase and images memorable as Mullins’ steady hand ensures they all work equally well in English, served by an elevated register of French that comes across as poetic and earnest and vivid in this context. Suzanne is 18 and off to study in Montreal. Talk turns to “systems of thought and worlds to invent.” There’s provincial and Canadian history, too, a swirl of references to the Duplessis government, L’Action catholique newspaper, and the launch of the Refus global manifesto, context for which is provided in translator’s notes at the end. Banned books, Automatism, and dinner parties (“You have a life. You wear it like a thin disguise.”) file by, Suzanne a “tightrope walker on the wire of history” as she abandons her family, puts her kids up for adoption, and moves to rural Gaspé, to Brussels, to England, to Harlem as it goes up in flames, to Alabama and the Ku Klux Klan. You are falling and you don’t know when it will stop. This deftness of touch made La femme qui fuit a very good book, a critical and popular success both in Québec and France. 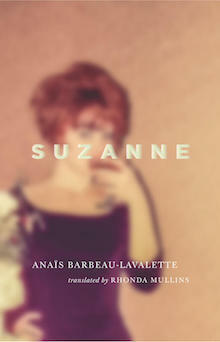 Now Rhonda Mullins’ sensitive translation makes it a worthy inclusion on the BTBA longlist.